These designer stand up foil accented cello bags have a soft bottom. Once filled, these bags stand up nicely, making a grand presentation for any product. These bags are made from 2.0 mil clear polypro films with several laminated foil accented designs to meet the demand of superb stand up bag packaging. Designer stand up bags are extremely durable, and you can fill these bags full with any heavy product. Unless punctured with a sharp object, these bags will stand up to some rough handling conditions. These bags are made in the USA and are FDA approved for safe direct food contact at normal conditions. 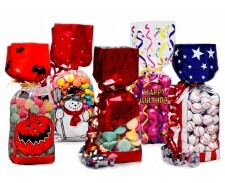 Soft bottom bags can be used for an array of products, such as nuts, chocolates, popcorn, caramel corn, hard candy, wedding favors, party favors, any type of goodie bag or gift packaging. These designer stand up bags make a exquisite presentation when closed with either curling ribbon or a bag tie twistie bow. They can also be closed with a simple twistie bag tie or heat sealed with an Impulse Heat Sealer. Small (2-1/4" x 1-7/8" x 9-1/2") holds 1/2 pound. Medium (2-3/4" x 2" x 11") holds 1 pound.